Popular Science has closed off commenting on its website. The reason, according to The Guardian, is trolls and spam. The sheer magnitude of it. Popular Science also cited a study that says commenting can change a readers opinion or perception of an article. Which, according to Popular Science, is bad for science. Especially when the comments are uninformed and contrary to, well, science. Is commenting a bad idea in general? I don’t think so. I think the way publications handle commenting is what is mostly broken. There is no doubt that the Internet is filled with agenda-driven trolls and spambots. My spam blocker on HighTalk traps somewhere between 25 and 100 spam comments a day. And still the spambots occasionally break through. I have less trouble with trolls, but I have a much smaller audience than the Huffington Post or the New York Times. I read comments – especially on opinion pieces, op-eds, and blog posts. I don’t so much on news articles or YouTube videos. I also find comments on Amazon.com, Yelp and other review sites a big help when they are thoughtfully written and contain important details. Reviews that use only a few words and say “awesome” or “awful” don’t help anyone. So I like comments. They add to my online experience. They can form the basis of an online community. Publications should start putting more value on building online communities rather than simply pushing out information at people. Communities are loyal. They come back for more. 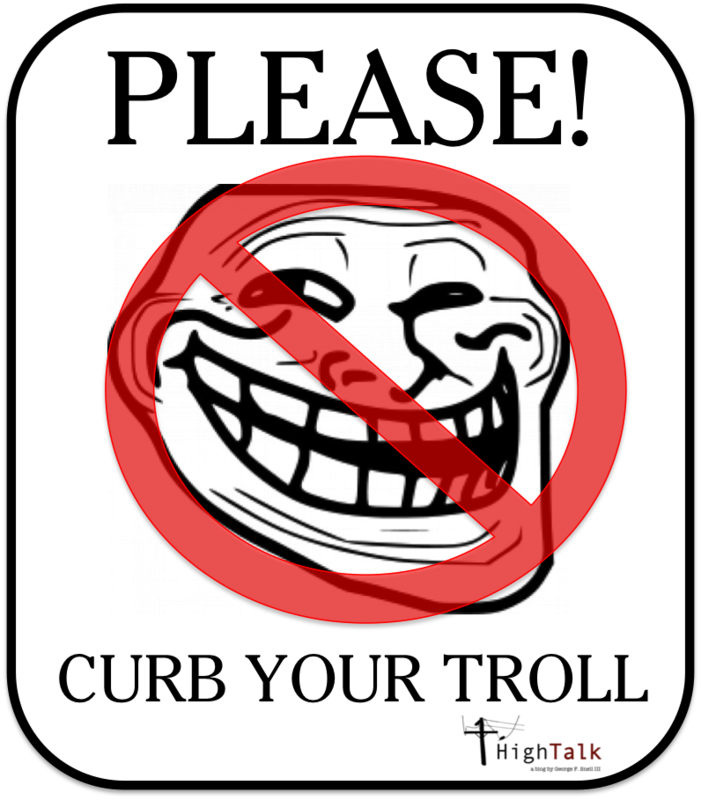 So allowing trolls and spambots in your community is like allowing weeds to take over a garden or litter to cover your community streets. Simply removing the garden or the street from your community, however, isn’t a real answer either. To build a community and encourage and promote valuable commenting, publications need to put some effort behind it. Most of them simply let the commenting sections become a free-for-all. No one watches it. No one monitors it. Or if they do they are understaffed. 1. Real People Only. Do not allow anonymous commenting. Everyone has to leave a real name behind – or a real identity. Require registration to comment. Anyone who wants to comment needs to leave a name and an email address. Or you can use one of the many commenting services to manage it for you. Use Facebook Connect. Require commenters to register through their Facebook accounts. 2. Delete/Ban the Offenders. One warning. The second time you’re gone – forever. 3. Engage. The problem with many publications is that a community manager or the writer doesn’t actually participate in the debates about their stories and blog posts. Decorum goes up when commenters know that people are listening – that people are talking with them. 4. Filter out profanity. There is too much profanity on the Internent. If you are not creative enough to find a different verb or adjective then your comment is automatically NOT posted. 5. Have rules. Enforce them. Make examples out of the offenders. 6. Encourage other forms of participation. Commenting isn’t the only thing your community can do. Have them participate in polls. Have them interact and share applications, charts, videos and graphics. Ask them specific questions. Give them ways to participate in the news cycle or add to any unfolding story. What do you think about commenting? Agree with Popular Science? Disagree? Why don’t you leave a comment and tell me what you think. Does Commenting Add Any Value? Excellent take on comments. I’m passing this one around the newsroom. I like having comments and I see them as part of the reader experience. There’s a difference between trolls and inarticulate commenters. I have confidence that most readers can filter out the BS. One downside to reader comments, as you point out, is that when readers recollect the story they are apt to blend the story and the comments. I think that is one of the reasons why Popular Science ditched them. In the early days, our reader comments appeared right below the story. Made sense at the time. But then, fearing that readers might mix the two (“I read on telegram.com…..”) we made the comments a click away.